When he was a boy Robert Perry used to draw pictures of his future self in a lab coat holding a test tube. He had wanted to be a scientist for as long as he could remember but, as someone with autism spectrum disorder, he struggled with education despite his intelligence. “I have never been much of a student, or maybe I have just never had a school that was meant for me,” the 30-year-old said. On Thursday, Perry graduated with a Master of Science with distinction alongside 569 fellow College of Science graduands. 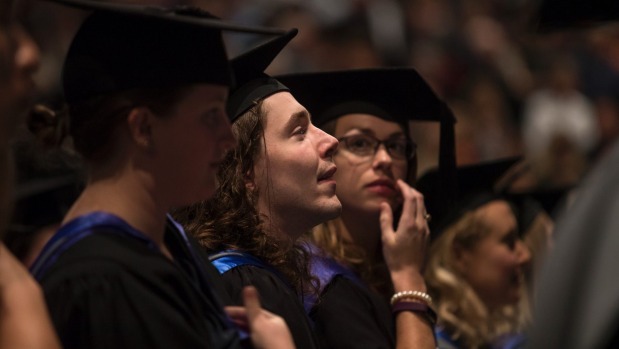 The University of Canterbury (UC) awarded more than 2400 qualifications between its December and April graduation ceremonies. Another 654 qualifications were awarded in absentia. Perry’s thesis – Techniques for Imaging the Endoplasm and Vacuole of Characean Algae – was a natural follow after his science degree and Postgraduate Diploma of Environmental Science, he said. Altogether it had taken him 10 years. “Taking my time was a big part of my ability to keep going. I’m one of those types of people who would rather do it slowly and extremely correctly,” he said. Perry arrived in Christchurch a “troubled kid” from a poor area of Texas in the United States in 2004. He enrolled at Burnside High School where he excelled academically, but struggled to fit in. He said he could sleep through classes and still outperform his peers, but his lack of study habits caught up with him at university. Perry said his downfall was his different approach to socialising. He was often alone as others made friends and formed study groups. “People don’t realise how important socialising is. Learning with other people has been scientifically proven to help you retain what you’ve learned. Though finishing his thesis was “pretty rough”, it felt less like studying and more like engaging with his personal interests, he said. He put his success down to perserverance and the assistance of UC disability resource service advisor Rachel Rogers who “always had a game plan when I was panicking”. Rogers said the transformation she had seen in Perry over the past 10 years was “absolutely fantastic to observe”. “His confidence and his outlook has improved tenfold since I met him. Perry said getting a good result in the end made his efforts worthwhile. He hoped to put his education to good use working for Environment Canterbury, Landcare Research or the Ministry for Primary Industries.